Renah Wolzinger hears and sees more than most people. That is because she is an instructor and program coordinator of Audio and Video studies here at Golden West College and has over 20 years experience working with vocalists, bands, dance teachers, and film directors on most things heard or seen. Renah teaches courses in Commercial Music -Recording Arts, Audio Engineering, Home Recording and Audio for Film and Television for students at GWC. She also teaches the how-to of software such as ProTools, Digital Performer, Logic and Final Cut Studio. If that is not enough, Renah is also president of Renzone Music, a Huntington Beach-based audio and post-production company that handles video and audio recording and editing services. While all this activity keeps her busy, she still has time to perform with her own band, the South Coast Party Machine and the SC Simcha Band, a Klezmer Revival band. Renah’s latest adventure is no less exciting than her CD “Yiddish America” being included in Grammy balloting for “Best Traditional World Music Album, 2007.” She was chosen to be a presenter at the 14th annual Technology in Education Conference and Exposition, which took place in Ontario, California March 22-29, 2009. In her session “Interdisciplinary Studies in New Media for Community College Students,” Renah addressed how documentary filmmaking can be an effective way to combine courses in Digital Media. Renah believes that today’s students are attending community colleges with some experience in basic video and audio editing, as well as graphic editing and internet site building. With this in mind, Renah states that her goal is to motivate students by having them create a work of art on a topic of their choice while incorporating interdisciplinary studies in digital audio and video editing, graphic arts and web streaming. “Students will be better prepared for today’s workplace using this approach,” she believes. Additionally, students attending a traditional Recording Arts program will find that they can incorporate editing skills usually found in the video world, creating new opportunities both artistically and professionally. Her presentation included a hands-on computer lab with software for audio and video editing, as well as the Adobe suite for graphic editing and internet streaming. Educators experienced making a short video using Apple’s Final Cut Pro Suite and Logic, and then, using graphic and internet software, created content for DVD or web streaming sites such as You Tube. Excerpts of documentaries made by GWC students were shown during the presentation as a representation of a successful teaching model in interdisciplinary studies. Renah hopes that this presentation will be the beginning of demonstrating similarities in software from different fields of study, understanding how to teach students to combine audio and video to create works of art and how to use this approach to enable community college students to have more marketable skills when they complete the program. “I always hope to inspire my students to be creative and go for their own musical dreams,” she emphasizes. During her six years at GWC, Renah has tried to let students in her courses know that pursuing a career as a sound engineer can lead to careers in commercials, international or broadcast marketing, and sound for movies, video games, animation, CD’s and live music projects. If they use her as an example, everything that can be seen and heard can become a vital part of their world. To find out more about Renah or see her work, visit www.renzonemusic.com. 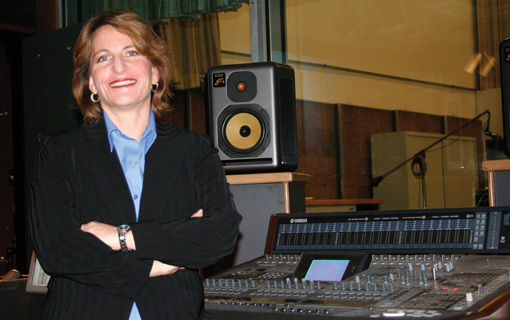 GWC Music students, faculty and alumni have won dozens of Grammy Awards.